Discussion in 'Development' started by RJ, Mar 5, 2017. So this is a small website I whipped up during a class in college. I didn't do anything with it since, but sometime yesterday I felt like writing a blog post about it but I ended up working on it again. 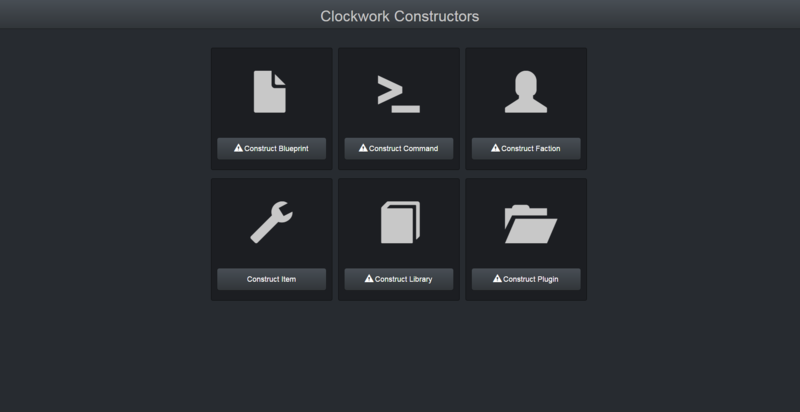 This is meant to replace my program called Plugin Constructor and to add constructors for numerous things to make Clockwork development easier. This constructor is due for release first. The first iteration won't be able to construct a fully loaded item, but it will give you the basis for one. The second iteration will add in all (or most) possibilities for an item which would include base specific configurations (e.g. selecting an ammo type). The first iteration will follow the same milestones of the item constructor in that it'll give you the basis of a faction (e.g. name, models, basic faction logo definition, etc.). The second iteration will provide more customization (faction logo upload and implementation), class creation (name, wages, decscriptions, etc. ), maybe auto name generator for said faction, etc. This part is the easiest and I'm saving it for last. 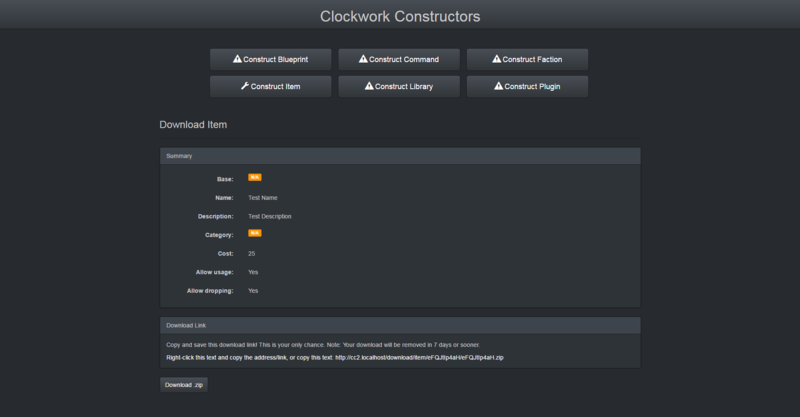 It entails just creating folders and basic files and would largely be a copy/paste from my Plugin Constructor program. In the meantime just keep using the Plugin Constructor program since that works just as well. Downloading is pretty straight forward. After construction you'll be presented with a summary page and given an opportunity to take note of your download link (it'll be removed within 30 days). Your construction will be in a .zip file that you can download by clicking the button at the bottom of the page or by clicking the URL. So yeah, that's it! Questions, comments, concerns always welcome as usual. For those that have seen this before and are wondering what's different, things actually do more of what they're supposed to do now (not as much smoke and mirrors). Make an option to manually write Lua functions (such as OnUse, OnDrop, etc. Not just a yes/no checkbox) before you download the constructed version. Make an option to add custom fields to stuff (just a "+" button that lets you specify field name and it's value, also let those values be functions and let people write custom code in). It'd also be nice if you added syntax highlighter for aforementioned function editors. Make an option to manually write Lua functions (such as OnUse, OnDrop, etc. Not just a yes/no checkbox) before you download the constructed version. I can probably add a Custom Functions section where you can enter these 3 things as many times as you want: Function comment (optional), function name, and function parameters (decimal separated, leave blank for no parameters). I'll be keeping the checkboxes for the most used functions (e.g. OnUse, OnDrop, etc.). Make an option to add custom fields to stuff (just a "+" button that lets you specify field name and it's value, also let those values be functions and let people write custom code in). It'd also be nice if you added syntax highlighter for aforementioned function editors. I can do the same as I mentioned above but named as Custom Fields. It would allow you to set the name, and the value would have to written out in its entirety for what you want it to be (e.g. if it's a string you'd have to surround your value with quotes [""]). I won't be adding any syntax highlighting as that is out of scope for this project. 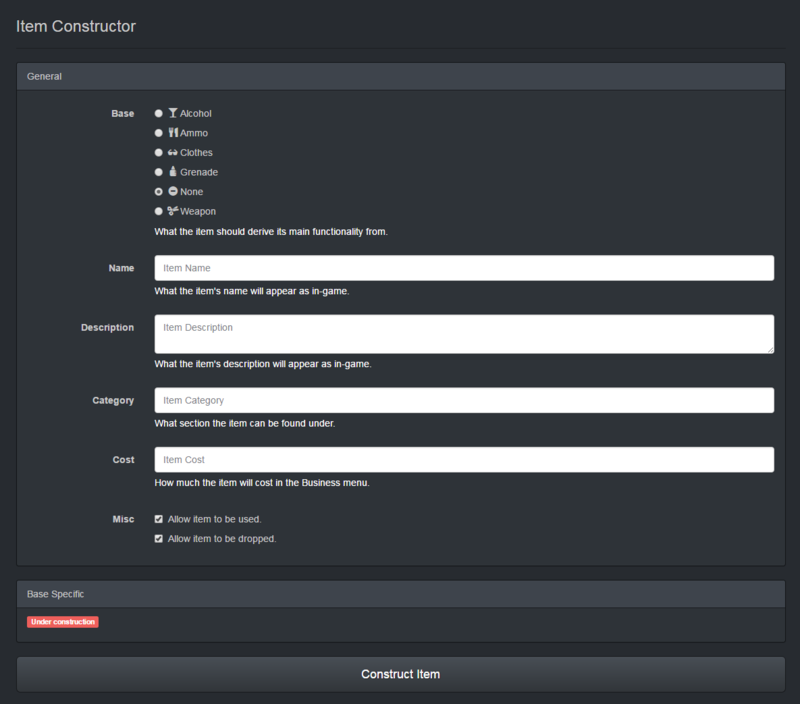 I'll see if I can get those features added for the beta release of the Item Constructor, but more than likely it'll be for the final release. Thanks for the suggestions! Looking forward to this, nice work @RJ! Alpha release will be delayed by 1 week (or less depending on how much progress I make). I've mostly been working on stuff that'll prevent people from abusing the system (e.g. 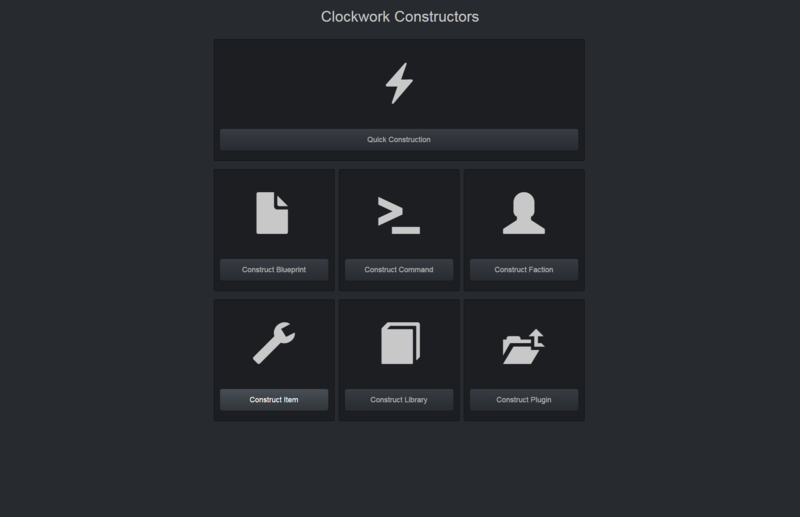 spamming refresh to create a bunch of constructions) and it's taking longer than expected. 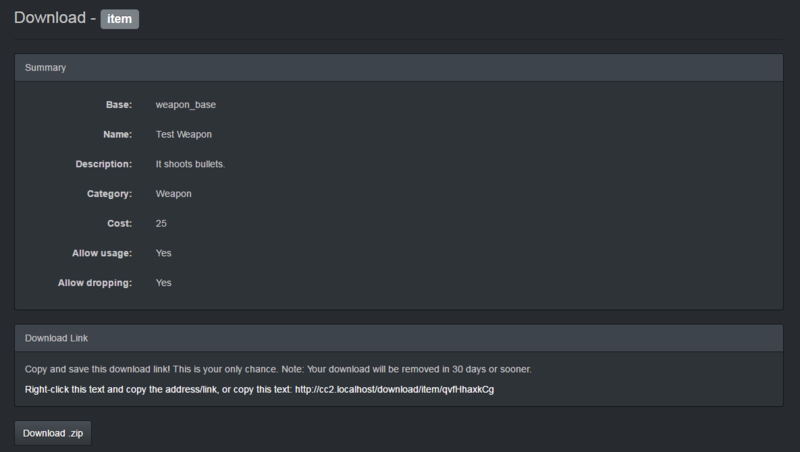 Functionality is complete and what not, I've just got to finish the boring stuff... So yeah. Now enjoy some more pictures (not too much is different, but this is what the alpha release should look like). So I made the mistake of planning to finish this up the day after my St. Patrick's Day party. Suffice it to say, that didn't go as planned... Regardless, I have this weekend open so the first iteration should be release at the end of this upcoming weekend or sooner. Can't wait for this! 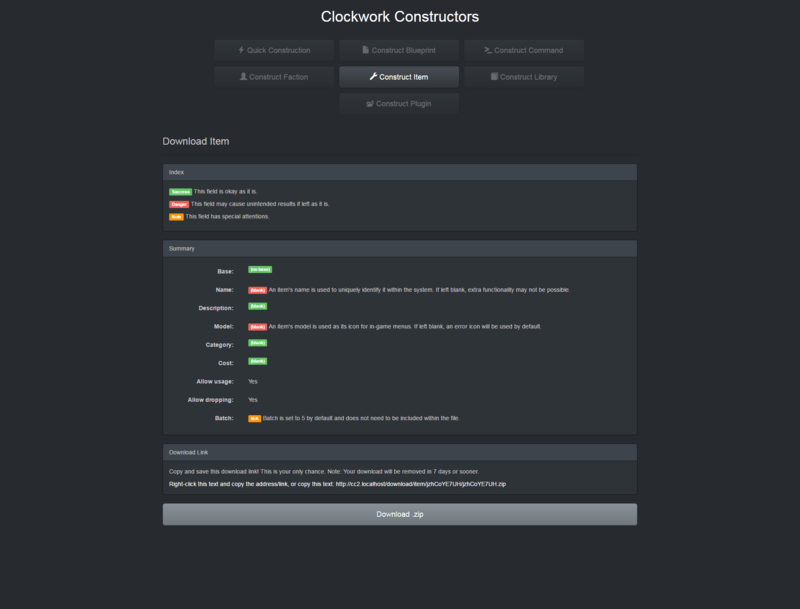 I'm getting into developing for Clockwork to help add items to a HL2RP server and making crafting recipes so this will definitely help. Gonna save so much time. I officially love you RJ. LOVE you. Very nice work RJ! I probably won't see myself using this tool but I bet tons of people will get miles of use out of it. 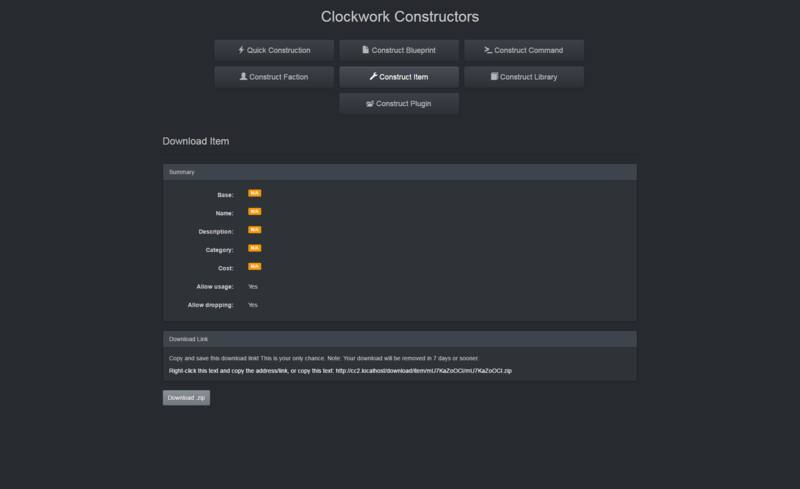 Clockwork Constructors' Item Constructor has been updated to include the item model and batch fields. 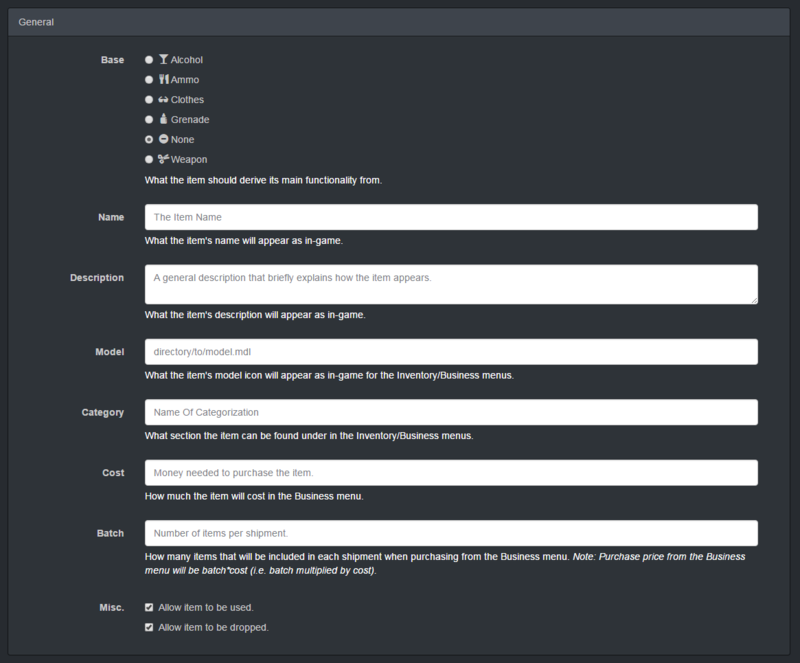 I've also made the descriptions for the different inputs a bit easier to interpret. - It's easier to understand. - It's harder to understand. - It's about the same difficulty to understand as before, or not enough to notice. 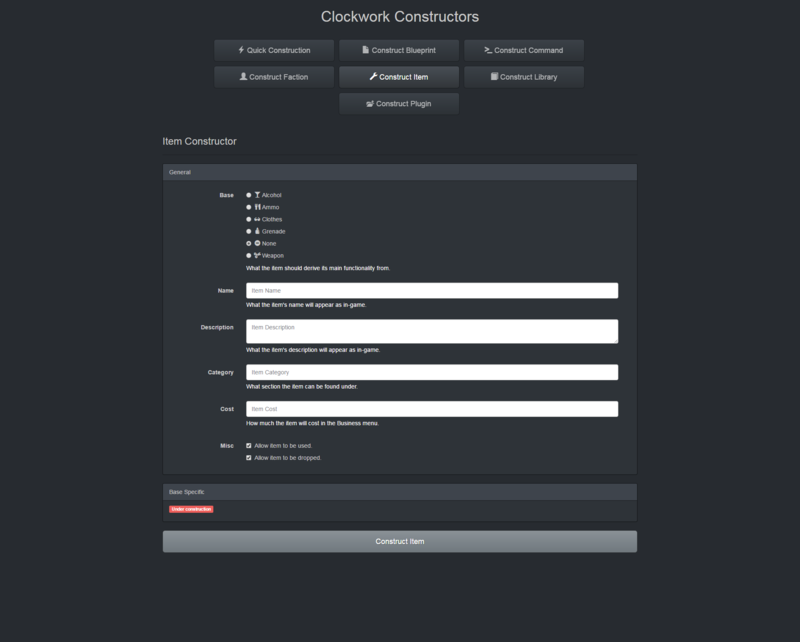 Clockwork Constructors' Item Constructor has been updated to include the item weight field.